When I was meditating the other morning, I was listening for guidance from the Holy Spirit on what I should pay attention to that day. In my form of meditation I mostly just pray and then just sit still for a long time afterward just listening as thoughts come up. I don’t follow the thoughts. I just let them arise and depart. It’s kind of like walking through a mall on the way to the quietness of your own car. The thoughts that come up are like people talking in the mall. I hear all the sounds but for the most part I am not paying attention to them. Every once in a while I hear part of a conversation, but I don’t stick around to hear how it plays out. The closer I get to the exit door the less of the voices I hear and by the time I get to the car and close the door, I am in Silence and all traces of the mall increasingly fade away. That’s how my meditation goes. Then while I am resting and being with the Silence I simply listen, feel, and wait. Sometimes that’s the extent of it and then sometimes out of the Silence there arises a simple unaccompanied non-reactive thought. The thought comes from Nowhere and returns to Nowhere. The thought for this day was, “We’re all invisible.” That was it. Silence—–“We’re all invisible.”——Silence. Think about that. Everything we see is made of things that we cannot see. Have you ever thought about how little we see in the world. Like the proverbial “tip of the iceberg” we only see a small portion of what is actually here. But this notion goes even deeper than that. 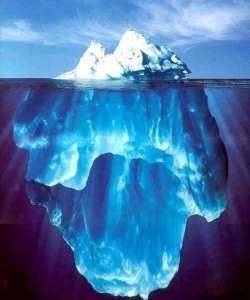 It says that even if you see the rest of the iceberg, there is infinitely more that you cannot see that has allowed the iceberg to even come into being. It’s as if what we see as the “real thing” is just a shadow of the real world that we cannot see–the world of God that pours into our world as we come face to face with the light. James 1:17 – Every good gift and every perfect gift is from above (beyond), and comes down from the Father of lights, with whom there is no variation or shadow of turning. Can you consider the possibility that almost everything about you that can be seen or observed in anyway only says as much about who you really are as your shadow when the sun is at your back? What if you and all of that you can sense through corporeal and cognitive (physical and mental) means says almost nothing of the magnificence from which you emerge? James called God the Father of lights. Jesus told his listeners they were the light of the world. That light that you and we all are comes from everything we cannot see. Our faith tells us that. When we forget, it is because we are putting our faith in shadows. We are more than shadows (ego). Are you ready to see who you really are? Stay tuned. We’ll be getting into that soon. Hebrews 10:1 – Since the law has only a shadow of the good things to come and not the true form of these realities, it can never, by the same sacrifices that are continually offered year after year, make perfect those who approach.